Make no mistake; that Sega has chosen Apple’s mobile devices over the Nintendo DS or the PSP as a key release portal for the first direct successor to the classic Sonic games in 16 years will surely cement the iDevices as competitive gaming devices. Sega is smart for recognizing how much a force Apple now is in the industry. It has nowhere to go but up from here–even in the face of Android. It doesn’t matter what score I give Sonic 4‘s mobile edition, because it will sell off the App Store with the same speed that Sonic has held for nearly 20 years. But just because you know a game’s a sure hit doesn’t mean it’s a quality product. With all the hype, promises, broken promises, revisions, and changes made through the Summer and before, this game is under one collective microscope shared by all Sonic fandom. It is not perfect; in fact, it is far from perfect, and even casual Sonic followers will notice flaws. Those seeking the holy grail of continuity won’t find it here, despite its designation as a direct descendant of the classics. For $9.99, players can download the mobile port to their Apple device. While virgin eyes may be in awe of Sonic’s 3D model among several vividly rendered 2D environments, more experienced fans, old and new, will immediately recognize and hopefully appreciate the deja vu. There are too many callbacks to classic games jam-packed within Episode I to count, from badniks and boss battles, to special stages and endless waterfalls, to slot machines, rings, springs and other things. An argument could be made that if a nostalgia trip on this level, was desired, one could simply purchase the classics that have been re-released ad nauseam. How difficult it was to make Sonic 4 a truly new adventure we may never know. With Dimps principally at the helm of development, a change in physics and control that hails more toward the Sonic Rush franchise in retrospect isn’t all that surprising–why not work with what you’re most familiar with? 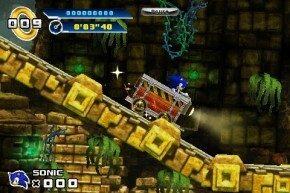 While I was never thrilled with Sonic’s in-game speed compared to the classics, I also to this point have not been able to replicate some of the associated quirks that accompany this engine, including but not limited to standing on steep inclines and mine car anomalies. That’s saying something, considering for all intents and purposes this is the first “final” build, the one Sega intended to release in Summer before leaks and fan backlash forced a delay for retooling on consoles. The homing attack, in particular, is a blessing and a curse. In my playthroughs, it allowed me to navigate through deliberately placed lines of enemies with ease, start Sonic’s momentum faster versus an idle state, and even get in some quick double hits on bosses. But on several instances where the a split second decision to use attack is necessary, I constantly found myself taking damage, if not falling into a bottomless pit. That uncurling is introduced in Sonic 4 adds to the trouble. 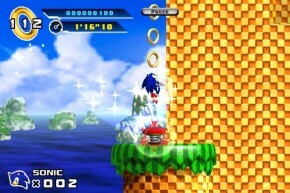 In previous games, Sonic could simply use his curled up spines to blaze a trail through enemies in the air. That, more often that not, is no longer the case. The homing attack would be more effective if uncurling weren’t a constant from it after the fact. All of that could be excused if the control setup weren’t so, pardon the pun, touchy. When I first sat down with the game on an iPhone 4, the on-screen D-pad felt surprisingly responsive. As time moved on and I needed to make more snap judgments, however, the response time felt sluggish. This felt especially true in Mad Gear and E.G.G. Station Zone, where a lack of precision yields a sometimes significant loss of lives. Quality execution of the accelerometer and in-game tilting is also hit and miss. The game’s special stages are exclusively controlled by tiling the device; that may feel natural to gamers used to it with Apple’s vast game library on the App Store, but I ended up feeling more nauseous than anything else. Ironically, the most criticized component of the game–Lost Labryinth Act 2, in its original form for the mobile port–wasn’t so bad, even with the need to tilt. That may have been because the level, for the most part, was a straight shot through, with little platforming required. It’s not something I would revisit, but it was much less painful than fans made it out to be. A level that was far more painful and I would absolutely never revisit is Casino Street Act 2, the score attack level. Why anyone would approve something so monotonous, restrictive, and generally broken is beyond my understanding. The level has no unique accelerometer or tilting gimmick whatsoever–you’re just confined to a single pinball-like board, aiming for the slots, and hoping a quick exit is in the cards. Sonic bouncing off a flipper just right makes for frustrating control, and while I can excuse most every other change to Sonic’s physics and acceleration in this game, when that combination is required to proceed it has to work–plain and simple. Sega would have been much better off to bring the revised act across all platforms, because this, not Lost Labyrinth Act 2, is the best microcosm of key issues inside all versions of the game. I’ve been able to enjoy even less than average Sonic fare because the soundtrack brings depth and environment to a title like nothing else. But I agree with my colleague that the game’s music does nothing to help the overall product. Maybe I’ve just been spoiled with such amazing tracks in Sonic Unleashed and soon in Sonic Colors, but having to adjust to synth, and a lot of it–a deliberate contribution to the game’s retro intent–doesn’t feel right. Lost Labyrinth and Special Stage tunes may be the closest to setting a tone, but everything else sounds like a repetitive drone of noise and, in the case of the main boss theme, borderline inappropriate. Recycled from an unused track of Sonic 3D Blast, there’s likely a reason the music in particular got tossed; it never evoked the urgency of a battle between good and evil. It didn’t work then, and it doesn’t now. If anything, the price is right; at least compared to its $15 counterparts, $9.99 for the first in episodic fare isn’t that bad. When Game Center support is added there will be reasons to replay the stages, if only for bragging rights on leaderboards. I’ve found myself replaying Splash Hill a great deal, with some Casino Street Act 3 mixed in. That will be what gives Episode 1 legs as we wait for the second offering, but why an update is needed for something that seems a no-brainer to offer from the beginning is puzzling. If this is the new normal for 2D Sonic, I’m willing to adapt. I say that despite all the hype, promises, pomp and circumstance this game was given going back to this time last year. 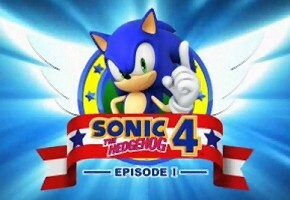 I’m not reviewing Sonic 4 based on how Sega promoted the game, as I feel a lot of jaded fans are doing–I’m rating it based on what I’ve seen, heard, and played. I think there’s potential in what I’ve played, but I only marginally enjoyed how all of it was executed. For me to be willing to adapt, there needs to be more compelling reasons than is evident in Episode 1. Sega deserves credit for listening to fans starved for a proper 2D Sonic, but listening, saying, and doing are all different things. For episode 2, I hope Sega will listen less and do more. As I said at the beginning of this review, Sega is smart for recognizing Apple as a mobile powerhouse. Now, the time’s come to recognize the talent within itself, set a higher standard, and give audiences something that, with a lot more care than demonstrated here, can exude greatness.